Grateful Hearts gifts for Teacher Appreciation Week can no longer be ordered! Thanks to everyone who is sending thanks to Unit 40 personnel! Watch for the Grateful Hearts sale during the next school year! Do you want to say THANK YOU to your child’s teacher, bus driver, coach, paraprofessional, secretary, or any Unit 40 staff member who has a positive impact on your child’s day but don’t know what to give or have the time to shop? The Grateful Hearts Donation provides a way to give DOUBLE THANKS to any staff member in Unit 40 schools! 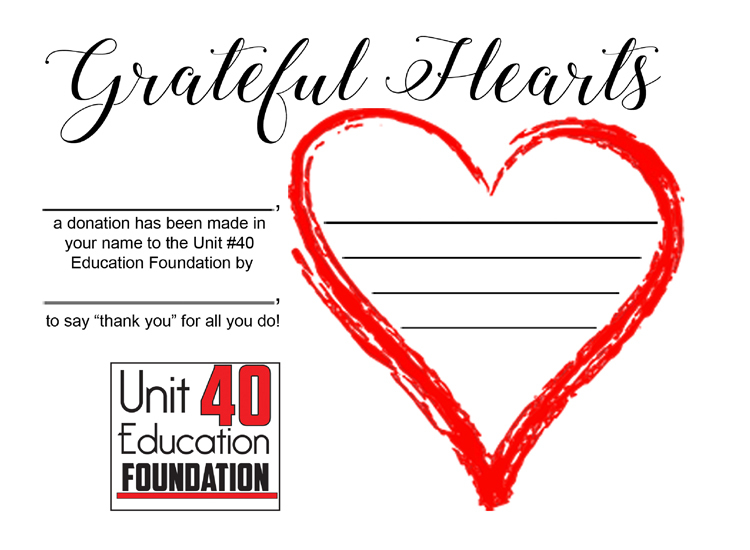 With a Grateful Hearts Donation you can say “Thank you” to your chosen staff member AND make a donation to the Unit 40 Education Foundation in his or her name at the same time. That donation will fund teacher grants for classroom materials and equipment and scholarships for EHS graduating seniors. Two Grateful Hearts donation levels are available. 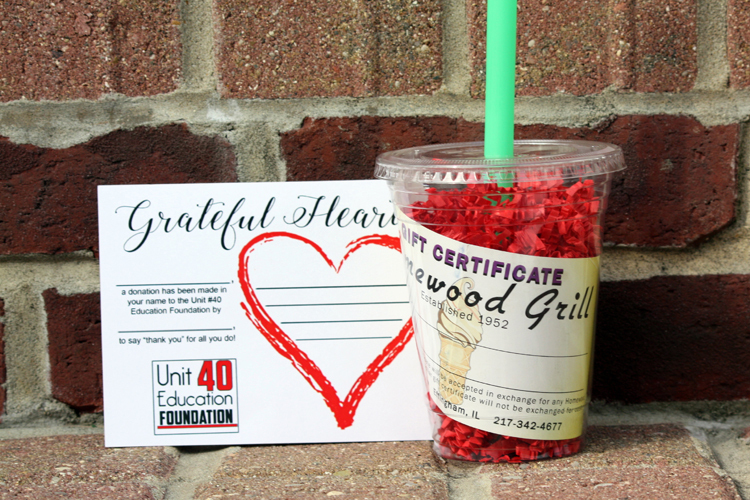 This level includes both a donation to the Unit 40 Education Foundation in the recipient’s name for $20 and a $5 gift certificate to Homewood Grill with a card containing your short, personalized message. The gift will be hand-delivered to school by a Foundation member. This level includes a donation for $10 to the Unit 40 Education Foundation in the recipient’s name with a card containing your short, personalized message. The card will be hand-delivered to school by a Foundation member. Two ways to order your Grateful Hearts donation are available. Click here to complete your online order. Deadline is April 28, 2017, with delivery to school during the first week of May.